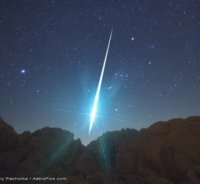 A Geminid fireball explodes over the Mojave Desert in 2009. Credit: Wally Pacholka / AstroPics.com / TWAN. It's also NASA astronomer Bill Cooke's favorite meteor shower—but not for any of the reasons listed above. Most meteor showers come from comets, which spew ample meteoroids for a night of 'shooting stars.' The Geminids are different. The parent is not a comet but a weird rocky object named 3200 Phaethon that sheds very little dusty debris—not nearly enough to explain the Geminids. "Of all the debris streams Earth passes through every year, the Geminids' is by far the most massive," says Cooke. "When we add up the amount of dust in the Geminid stream, it outweighs other streams by factors of 5 to 500." Researchers have looked carefully at the orbits of Geminid meteoroids and concluded that they were ejected from 3200 Phaethon when Phaethon was close to the sun—not when it was out in the asteroid belt breaking up with Pallas. 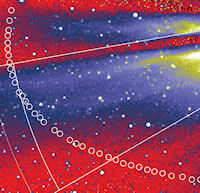 The eccentric orbit of 3200 Phaethon brings it well inside the orbit of Mercury every 1.4 years. 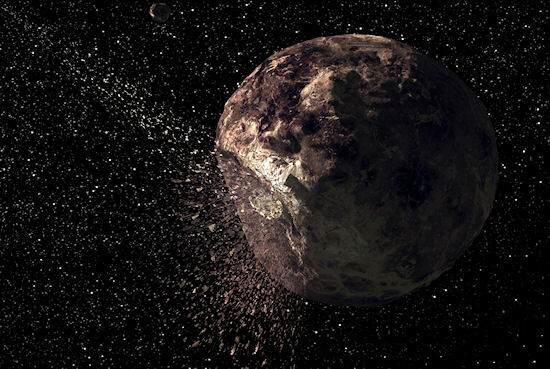 The rocky body thus receives a regular blast of solar heating that might boil jets of dust into the Geminid stream. Jewett and Li's "rock comet" hypothesis is compelling, but they point out a problem: The amount of dust 3200 Phaethon ejected during its 2009 sun-encounter added a mere 0.01% to the mass of the Geminid debris stream—not nearly enough to keep the stream replenished over time. Perhaps the rock comet was more active in the past …?